You are currently browsing the tag archive for the ‘blog business’ tag. I don’t know if it gets better, but I hope it does. I realize that I’ve been absent from the blogosphere for about six weeks now, but I have a good reason, and I’m ready to talk about it. Or maybe not ready, but I’m feeling emotional enough to talk about it right now. It’s not something that I’ve never talked about. I may have mentioned it on here before, and lately I’ve been writing a bit about it for a creative nonfiction writing class I’m taking. But I’m addressing it here and now for a few reasons. One, I just realized how long it’s been since my last post, and maybe I have a few readers who would like to know what the deal is. Two, the recent spate of bullying and suicides has made me think about the importance of stories, just stories, that people can relate to. I don’t have a “I was bullied as a gay kid in high school” story; that’s not my past and that’s not my story. But I do know what it’s like to be a kid and to be bullied, to be depressed, and to be suicidal. Three, I have something of an impulse to write my story, or to tell it, because I am good with words and because I feel that my experience is unique to me, but also universal in its themes, and I don’t feel like it gets told enough. So here it is, if I haven’t given it away already. I suffer from mental illness. Depression and anxiety, for sure, although bipolar disorder has not been ruled out. I have been in therapy since the age of 10 or 11. I wasn’t diagnosed with depression at that age. I was just a sad, lonely, guilt-ridden kid whose parents had split up. It wasn’t until middle school, when I couldn’t get on the bus in the morning because I’d start crying, fit to puke, every time it rolled around the corner, that I was diagnosed. School sucked then, and it took an emotional toll on me. I slept all the time, cried at school, had no friends in my classes, never talked, and was teased a lot. Freshman and sophomore years of high school were better, but not much. Slowly, though, with the help of counseling and anti-depressants, I came out of my fog. School got better; I found things I was good at: singing, acting, writing, making people laugh. Then my home life started to get tough. I won’t go through the details, because I get sick of talking about it, but my parents (who separated when I was 10 but then got back together) got a divorce, and lots of things changed. I quickly had a new stepdad, we were going to sell my childhood home, and I even had to get rid of my dog for a while. Things were odd, and to top it all off, I was having that mini-existential crisis that every senior in high school has. My depression was back. My family problems didn’t get much better, and neither did my emotions. Going away to college helped a lot, but I could almost always count on another depressive funk every winter. Last year, my junior year in college, I started to struggle with sleep. I wouldn’t sleep until 3 or 4, sometimes 5 o’clock in the morning, and I’d still have to wake up around 9 or 10. So I was living on about five or six hours of sleep a night. It caught up to me after a while, I guess, but I couldn’t fix it. To top it all off, I was irritable, couldn’t concentrate, couldn’t quiet my mind, had racing thoughts and just a general sense of anxiety. I didn’t go to class as much as I should have, and I couldn’t keep up with the reading I had to do. So, this summer, I set out to find a fix for this. However, the first medication the doctors put me on made me insane. It made all of my symptoms 100 times worse, amplified my restlessness and made me snippy. I won’t mention the name of it because I know it works for a lot of people, but I personally couldn’t get past my fourth day on the medication. This was about two weeks before I had to move back to school. There wasn’t enough time to see a psychiatrist, so my family physician gave me some new meds to try. It’s not gotten much better here at school, although I have evened out some. I still feel restless, anxious, angry, depressed, listless, irritable, and a whole litany of emotions. I can’t concentrate. I’m suffering in all of my classes because it takes a miracle for me to accomplish my reading assignments. Also, I’ve had a handful of panic attacks in class, and so on my bad days, I can’t bring myself to even attend, for fear that I’ll break down and make a fool of myself during the lesson. I don’t have many friends and I don’t get out much. I’ve honestly considered dropping out more than once, and I probably would have if I were not on my last year of school. I can’t fathom that I might have wasted the last three years, and the money it cost me to be here, and that’s one of the few things that keeps me trying at school (although not trying as much as I should, sad to say). Advice columnist Dan Savage and his partner recently started an Internet campaign to let gay youth know that “It Gets Better.” More power to them, because the suicide rate for gay teens is insanely high, and the amount of bullying and pressure directed at them is absurd. I could barely manage to be a teen, period, so I can scarcely imagine. However, I’m not solely addressing gay youth here. It’s hard to be a teenager nowadays, no matter your sexual orientation. 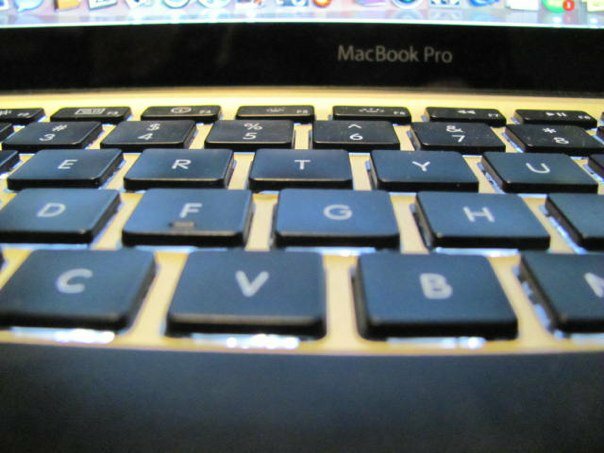 It’s hard (perhaps harder) to be a college student. The stigma surrounding mental illnesses and those who suffer from them is huge, and thriving. I feel a bit anxious just writing this, having heard horror stories of people losing jobs over their depression/anxiety/bipolar disorder/etc. I know the Internet never forgets. But this is an important part of who I am, and if it helps just one person, it’s worth it. To any kid suffering from a mental illness, I’d like to say that I’m not sure if it gets better. I’m still trying to figure that out myself, every day. There are days when you think that it is so much better. There are days when you think that it couldn’t get worse. I feel like I’m not yet at that point where I can say that it got better. But I hope it’s in my future. You should know that there are people out there who care, people who don’t want to see you die, who want to see you live until the day where you figure out whether or not it got better. Even if you have to pay someone to listen to your problems, I can promise you that there is someone out there who genuinely cares that you have them. I’ll listen to you if you want to talk. Never let anyone tell you your problems don’t matter enough. Never let anyone make you feel like less of a person because you have to take Prozac or Cymbalta or Lexapro or Wellbutrin or Abilify or Zoloft every morning. You should feel proud that you had the will to get help. My best advice is to take little moments of happiness and make them your everything. If someone smiled at you in the hall and that’s the best thing that happened to you all day, then tell yourself you had a good day because someone cared enough to notice you. I’m not one to say, “Just stop being depressed; think positive.” I know all too well that it’s nearly impossible to do that when you’re truly depressed. But that shouldn’t stop you from recognizing the good moments that do come your way, and I firmly believe that, if you can learn to appreciate the tiniest of moments, then you will learn to get at least a bit of goodness out of every day. I have my days where it’s hard just to walk to class. But then I have days where I hang out with a friend or my sister, and I wouldn’t trade that for anything. So I won’t tell you it gets better. I hope it does, but I don’t know. But until I do know, I’m going to make it my reason for living to find out whether or not life does get better. It’s not necessarily a light at the end of the tunnel, but a big question mark at the end of the tunnel. Still, it’s better than darkness. Sometimes a question mark just has to be enough. ETA: I don’t want to make it seem like I’m one of those people saying, “There are all kinds of depressed kids out there who are bullied, not just gay kids. Why not pay attention to them and not give gay kids special treatment?” I’ve heard that a lot lately, but I do not agree. I’m not sure of the exact statistic, but I’m pretty certain that homosexual teens are way more likely to be bullied and to suffer from depression and to commit suicide than heterosexual teens. I think it’s a specific issue that deserves a lot of specific attention. Would I like for there to be more positive awareness of depression and suicide in general? That’s a big resounding “YES.” But even I, a person who has been out there on the ledge as well, think that in this instance, gay teens (particularly those recent bullied suicide victims) deserve the attention. In fact, I wish we could give them more attention than a day of purple shirts. Also, I found this quote from “Infinite Jest” by David Foster Wallace (who was, sadly, also a victim of suicide), and I had to share it because it’s so on-the-nose. I agree. I think only those who have truly been in the same place can understand the pure agony that sparks suicidal thoughts. Everyone should be there to help, and everyone should be understanding, but there comes a point when you just don’t get it unless you’ve been there as well. But if you haven’t, that quote sums it up pretty well – you don’t necessarily want to die, but you’re in a place where it seems the lesser of two evils. Die by fire or jump from the window. This is why I want to speak out for depression and suicide. I know all too well what it’s like, and I feel like being in that situation as a teen, and now, and I’m sure in the future, has made me equipped to help, and I want to help, badly. Picture credit goes to my sister. 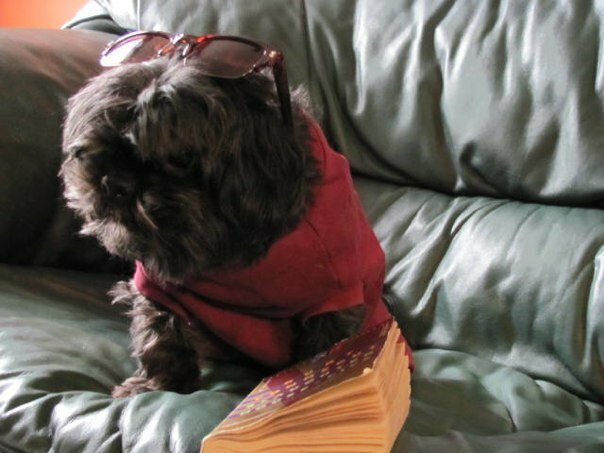 It’s my dog, Frasier, in a photo my sister and I took to submit to Hipster Puppies. He’s wearing my knock-off Ray Bans, a sweater, and he was “reading” Slaughterhouse-Five. Total hipster. Yes, this is the same old blog, but with a new header. The photograph was taken by my sister. 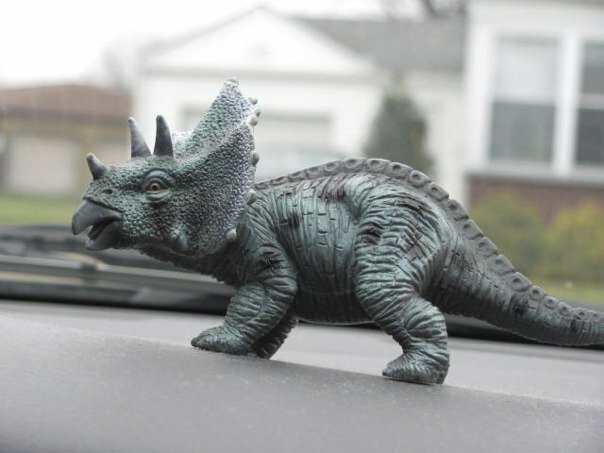 It’s a picture of the little dinosaur that sits on the dashboard in my car. Her name is Clementine. My sister’s camera is awesome, and I’m jealous of it. New year, new picture. I’m pumped.